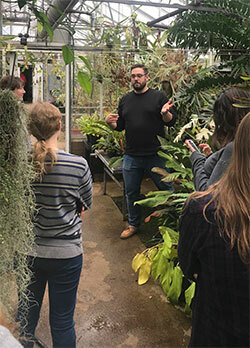 The Rutgers AHTA accredited horticultural therapy certificate program courses are held in the floriculture greenhouses on the Cook Campus where students can experience first-hand the restorative value a profusion of plants and people-plant interactions can provide. Here students learn the unique qualities of plants that are conducive to therapy, and how to apply this knowledge in professional practice. The profession of horticultural therapy employs plants, gardens, and greenhouses as tools for treating mental, physical, and social disabilities. The profession requires the integration of plant systems and culture techniques with human psychology and health. This program, which is fully accredited by the American Horticultural Therapy Association (AHTA), will enable students to pursue professional registration through AHTA. For additional information, contact Professor Joel Flagler (Program Director) at the Bergen County Cooperative Extension office, 201-336-6781 or , or Dr. Nrupali Patel (Academic Advisor) at .